We’ve all become familiar with the Repub/Fox routine of instantly responding to everything that happens while Obama is president (record snowfalls, children singing support of their president in school, American Idol inequities, etc.) as being his fault. If McCain had won, the snow wouldn’t have fallen, that guy in the Escalade wouldn’t have cut you off on the freeway and Lost would have had a way better ending. As part of this “jerk’s knee jerk” reaction, a disaster caused by the action or inaction of Bush is applied. “This looks like Obama’s WMD’s in Iraq!”, “Will this be Obama’s, ‘Heckuva job, Brownie’?”, “This is Obama’s Harriet Myers!”, etc. Jon Stewart did a great piece on this, showing a montage of such BS spewing from those slappingly snide mouths of RW pundits. As Stewart pointed out, isn’t it interesting that Fox and the RW aggressively defended and promoted Bush for eight years while he destroyed our country and economy…but now that common sense among the majority of Americans prevails that Fox, the RW and Bush were wrong, constantly making comparisons between Obama and Bush is now their tool of choice to denigrate Obama. Consider this for a moment, Fox and Repubs are presenting their president who they supported religiously as the high watermark (sorry New Orleans!) of failure. To be bad as a president is to be like Bush, they are saying. So vote out the Dems and Obama because they’re too much like us and replace them with us, the genuine article when it comes to failure? Huh? Are the majority of Americans buying this or seeing right through it, as the admission it is of Fox’s and Repub’s own failure and deceit? Now, however, comes a tough one. As much as I find these comparisons to Bush ridiculous, along with the accurate self-confessions by the GOP and Fox that they are what’s worst for this country…Obama’s handling of the oil spill does raise concerns and is leaving him open to claims of Katrina-like inaction, claims that could indeed stick…and might need a dispersant to break them up. First, Obama is not Bush. Bush is white and can’t properly pronounce “nuclear”. Obama is half white and half black (defined in the Cracker Dictionary as “black”) and understands the science that makes the word “nuclear” apply to something. So, putting any direct comparison aside, the performance of the Obama Admin on the oil spill crisis at the very least, does not come off very pro-active. BP, a corporation, continues to take the lead on all efforts to stop this disaster from growing even larger and they apparently are being allowed to mislead and censor the news and coverage about it (journalists have been prevented from taking video and seeing what’s going on with their own eyes). In fact, in preparation for their latest attempt to “top kill” the well, they are shutting off the camera showing the leak. Why? How does the public benefit from allowing them to mislead the public? Why are they given the power by our government to make such a decision? Sadly, all the interviews I’ve seen with Obama Admin officials have been touting the great working relationship they have with BP and how BP is working diligently. It does not seem appropriate that a corporation should be in charge of a national disaster but in fact, BP is our de facto leader on this crisis. This seems a bit similar to the financial crisis, when those who caused the mess were put in charge of stopping it and cleaning it up. The problem is that BP, as a corporation, has a primary duty to its shareholders, not the citizens of this nation. Yesterday it was reported that BP is refusing to reduce the amount of toxic dispersal chemicals they are pouring into the gulf. So, if the chemicals they are using lessen the financial impact on BP in terms of financial damages and clean up but greatly increase the death of sea life and shoots up cancer rates for those in the vicinity or those consuming gulf seafood anywhere in the country, that’s just fine with them (proving a link would be very difficult…who has ever been sued for all the mercury that’s now in fish?). Another issue, there may be many innovative ideas on how to stop this oil but BP would likely not be interested in any that would end the spill but shut down the well for good. They need the well preserved to make back the billions and more than it is going to cost them. So, it seems clear as a non-Gulf part of the ocean that BP could be prolonging this spill because all options that shut it down for good would be unacceptable to them. On the other hand, the government does not have the same priority, their primary duty is to protect citizens. Accordingly, it seems to make more sense for The Obama Admin to take over ALL operations in closing this well, they need to order BP to take action as directed. Let’s face it, BP not only deceived the government in assuring that such a disaster is not likely to ever happen, their pathetic efforts to stop it only confirm that they have not wasted any time or research into stopping such a catastrophe. So if they are no better prepared than the government, let the government be the organizer and the clearing house for ideas on how to stop this with zero regard for whether is allows BP to continue to profit off of this well in the future. Obama should appoint a Crisis Czar to head up efforts, someone with a solid scientific background that would be appropriate for this situation. There is a concern though about why our good friend Rahm and others in the admin might advise Obama not to do so, not to take action. As long as Obama and the government present BP as the one in charge, they are supposedly off the hook. The moment they appoint a czar or declare that they are taking over the decision making from BP, they “own” stopping this disaster…and could be harmed politically if they aren’t swiftly successful. I am not thrilled about providing any ammo to the Dem purists out there who look for any excuse to attack Obama alongside Baggers and the rest of the RW but it is a legit possibility that the spill could end up continuing longer because of the concern that Obama and the Dems could be “tarred” by taking charge. Even though this cynical assessment could be very correct, it should not take precedence over halting the destruction underway. BP’s next effort to stop the gushing oil will, perhaps Wednesday, is to involve a procedure called a “top kill,” in which heavy mud and cement are to be shot into the well to plug it up. The procedure has never been tried a mile beneath the sea, and company executives estimate its chances of success at 60 to 70 percent. Who knows, maybe this will work, I hope it does. If it doesn’t, how long will BP be permitted to be in control of a national catastrophe in this country? And when are they up for re-election? I wasn’t going to write in, but the first two responses you published made me feel that I had to. As my background [redacted] … It’s tough being an Obama supporter in the oilfield, especially in Houston. First, BP is not tackling this mess alone. The entire drilling industry is involved, including Exxon (who has a great record when it comes to offshore drilling, not oil shipping). It’s not like only BP engineers are calling the shots, all sorts of experts are involved. At BP’s West Houston complex, there’s a command center filled with personnel from around the industry working with BP engineers. Several drill ships are in place. Tons of workboats are on site. There are 5 or more ROVs roaming the wellhead monitoring and cleaning things up. They’re already bumping into each other because they normally work solo while tied to a ship by a mile long umbilical cable. They don’t need more ROVs down there adding to the traffic. All these efforts are reported heavily in the Houston Chronicle and nola.com, but doesn’t seem to get much for national coverage. If you only monitor the national coverage, you’d think BP is going it alone while we all sit by, but the reality is this is an industry-wide effort because we all know what’s at stake. This is so good to know Javaz -- it’s only been reported as bad, evil BP for causing the problem and not doing enough and wicked President Obama for not doing enough!! Bloody MSM -- they can never seem to report the whole story nowadays -- arrg!! Apparently, not enough mud is entering the pipe. It’s being pushed out the side of the blowout preventer by the pressure of the oil and gas. And where do these engineers come up with these names? Top Kill? It sounds like a video game. Why not just admit you screwed the pooch in the first place by removing the mud on the day drilling was finished? I, like you, find it much more easier to come to terms or in some cases even forgive, if people admit their mistakes or apologize. There was only denial and arrogance from BP and the other parties involved in this disaster. I feel nothing but anger and contempt for the lot of them now. Well, the chickens are coming home to roost. If BP admits it acted irrationally and irresponsibly then it is opening itself up to billions of dollars in claims. The only thing it can do now is hope the “top kill” works. Otherwise BP will be history. Whether or not that is a bad thing is open to discussion. “Open to discussion” as you state, then again after this and their other “accidents” who in their right minds would ever trust them again and if they do, it becomes their responsibility too should something like this happen again. Their call I think. People seem to find it hard to learn from past mistakes. Even an animal once too close to an open flame, has the sense or instinct to not do the same thing again. Makes you wonder, doesn’t it? I think what’s upset me along with the disaster, is the Obama-bashing, much of it from long-time Dems. I don’t know quite what to make of it & have found myself having lapses of mixed feelings, wondering if I don’t feel that same sense of disappointment. Do I wish he had been forcefully vocal from the onset, from the moment we all found out just how utterly devastating this on-going spill was ? Yes. However, if I’ve learned anything about President Obama by now, it’s that what appears aloof often betrays an immense conviction & low fanfare action, something I had come to depend on from him : that he in fact, was NOT lying back, but was accomplishing a lot behind the scenes. I choose to believe that this is the case with Obama & the BP tragedy. That we’ll learn just WHAT has been taking place behind closed doors & that his leadership was always strong, pro-active & intact, albeit not outwardly seen. The latest on “Top Kill” updated at 9:25 pm from the Beeb. That’s over 5 hours ago. Same story from The Guardian uk. So many good points, but I’m feeling too upset today to comment succinctly. The BP nightmare-come-true has taken its toll on me & my outrage is close to the surface, not too comfortable a feeling. As you can see, I’m very upset and frustrated too. It almost feels like being held hostage by BP. They caused this disaster out of greed and are being treated as the only experts in the world who can staunch this. I just don’t buy it. There are many other oil drilling companies and other entities experienced in deep sea exploration and operations. BP is not trustworthy, they want to preserve the well to pay for the damages they’ll owe and as BT mentioned below, if crimping the pipe was possible but killed the well, they simply wouldn’t do it. Still, I do hope this Top Kill succeeds. I’m tired of being held hostage. I hadn’t been awake before President Obama came to the forefront. Hadn’t paid nearly as much attention to US politics. Adlib I expected most of the poll numbers that say 53% (Obama), 60% (government) and 73% (BP) are doing a poor or very poor job on the spill. These numbers are going to be high as long as the spill is occurring. The people as expected have flip flopped on whether offshore drilling should be put ahead of the environment even though an amazing 43% would still put offshore drilling first. I guess that’s the size of the people who will vote Republican no matter what these days. The most interesting part of the poll is that over two-thirds of the people think BP should be heading up efforts to cleanup the spill. Thanks for the link, KQ! It is kind of an oily silver lining that this disaster has convinced a majority of what many of us already knew, greed is not good. Putting the planet in danger that we all live on just for the hope that the price of gas goes down is naturally short sighted. Americans in general don’t think long term. They seem more like children who want something today without regard for what the impact could be tomorrow. And they’re so fickle. I wish they could teach “vision” or “long term thinking” in schools. We would be such an advanced nation if most people thought that way. Well, I don’t find that so conspiratorial. BP has had a number of disasters at its refineries and rigs because of their greed in not spending money on safety and inspections. They are soulless creatures of greed, many people who loyally worked for them have died, been murdered in truth, due to BP’s valuing money over life. They do not deserve trust or respect and I don’t doubt what depths they could sink to in order to feed their greed. They are just doing now what should have been done in the first place. They never should have removed the drilling fluid on the day that drilling stopped. Upper level management didn’t want to continue paying big bucks to keep the drilling rig in place while the blowout preventer was retested and steps were taken to safely close the well head. It looks like someone is more frustrated than it appears. Since the oil rig exploded, the White House has tried to project a posture that is unflappable and in command. But to those tasked with keeping the president apprised of the disaster, Obama’s clenched jaw is becoming an increasingly familiar sight. During one of those sessions in the Oval Office the first week after the spill, a president who rarely vents his frustration cut his aides short, according to one who was there. “Plug the damn hole,” Obama told them. Maybe North Korea could have a sub shoot a missile at it and collapse the hole? I can only imagine how frustrated Obama is. Can you believe everything that he has had to deal with in his presidency…and it’s only been a year and a half?! The biggest problem is this sounds like an easy problem to fix but it’s far from it. Again I go back to my industry experience. I remember once a paper mill in Chilicothe Ohio I was visiting was down for over a month because a few pipes broke underground due to extremely cold temperatures. The company was losing millions and what sounded easy to fix just was not. Sure we will find where BP and government could have done things more quickly. But it’s easy to play Monday morning QB in these situations. North Korea is good with shooting torpedoes, just ask “little Kim.” On second thoughts, ask him when he stops jumping up and down screaming retribution for accusing them in the first place. What a dork! How can you tell when Li’l Kim is jumping up and down? The toddlers stop stepping on him. 😆 he’d throw you into the N.Korean “Gulag” for that. He just loves his platform shoes, they make his legs look longer so you don’t notice the size of his huge head. I am in agreement with your assessment that Obama MUST act and do so now. 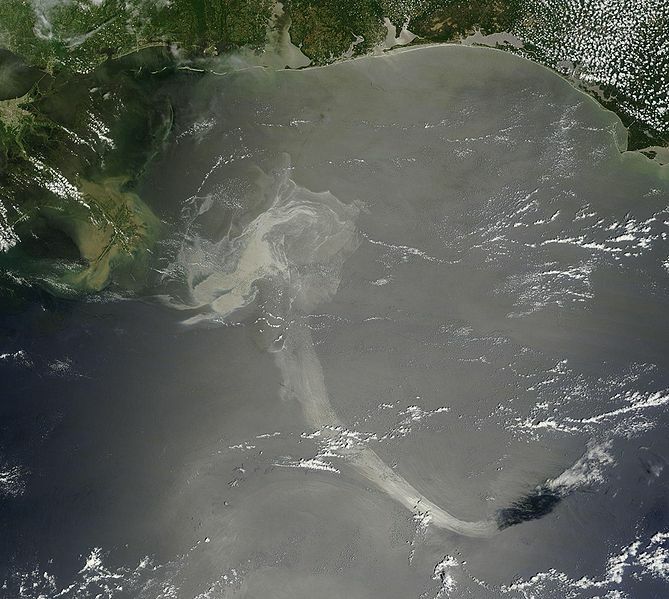 I fear it’s terribly too late for any real salvaging of the environment of the Gulf Coast, but it cannot go on. I remember, KQ (I think it was you) said that oil disaster experts were fuming that no one had demanded BP crimp the pipes as they do in well fires in the Mid East and elsewhere. Am I remembering this correctly? From the underwater pictures, it would appear that crimping the pipes would be feasible -- there is enough pipe above the seabed. Why is this not an executive order NOW? I realize that BP has to do this -- or someone in the industry does. But the order to DO it should come NOW from the White House. I don’t see how anyone will not blame this administration even if it’s illogical. So please -- is this NOT the thing to do? I’d love to have a “call to action” so we could be focused in what we want from the government -- and from the industry. Makes you wonder, what if an asteroid was headed for the Earth, would we turn to Haliburton to stop it then sit on the edge of our seats as corporations tried and failed? This is a national disaster and unfortunately, like Katrina, our government seems helpless to do anything. I appreciate my good buddy KQ’s reasonable position, BP are experts at oil drilling and the Feds aren’t. Still, I think Obama should step up as the big picture guy on this, let BP do what they think will work for right now but meantime seek input and ideas from every possible source nationally and internationally. I would like Obama to be managing this, BP’s being the leader on this crisis is getting very distasteful. But Walmart did have an impact on Katrina. There is the justifiable notion that the government is too bureaucratic to get things done in a timely fashion. Maybe we should call in Walmart again? Obama owns the problems this country faces that’s how it work. This is simply not a situation where doing more just for the sake of doing more is not necessarily better. I think what you are asking may change the optics but won’t help the problem. Oh BTW Haliburton is the biggest expert at stopping spills. That’s how they got their bones by stopping all the spills after the first Gulf War much faster than people expected. Talk about a damned if situation. I think one of the problems is everyone including Obama thinks blocking the leaks is somehow easier than it really is. I didn’t bring up crimping and I doubt they have the submersible machinery powerful enough to crimp a pipe that size at that depth. If anything they are going to try and recut the pipe to fit a new check valve on it to stop the flow. A big problem is that the pipe was sheared off in a crooked fashion or the riser pipe would have worked. Having actually worked in an industry that mostly regulates itself I find most of the criticism vastly uniformed. At two chemical plants I worked near the last thing you would want are local fire fighters controlling the response teams to chemical fires. They simply do not have the expertise to do so. Like it or not BP has the only people that can really do anything about the spill. Sure you can blame the offshore drilling policy and oversight but the response has been exactly what should be expected. The Obama administration can and has dictated that they need to stop the spill but that does not change the dynamics. This is not like Katrina were the source of the problem is widespread. The source is a pin point and a 500 person response or a million person makes no difference. Katrina was a classic case were the government had the resources and failed to deploy them. What’s more important is how the cleanup is managed by far. Absolutely, the cleanup is going to be so critical. Unfortunately, word is that it will be near impossible to fully clean up and preserve the wetlands in LA. I mentioned in a reply to you below, I would suggest that BP is not an expert in stopping a deep sea well that’s spewing oil. They have consistently downplayed and neglected any preparation for this kind of situation. I see no evidence of any thoughtful plan existing prior to this event. I agree with you that throwing lots of people or lesser experienced people at this is not a good way to go. So, my proposal is that the Feds should take control and use BP as their logistics and operations team but shop around the country and the world for the best ideas on capping this well and order BP to figure out how to make it happen. Bing! That would demonstrate that Obama is in charge and a man of action. It’s always a good idea to get a second opinion. A good doctor would invite that. The only patients here are the marine life and littoral biota which will become decimated. Not shareholders and particularly not the egos of BP. Let them lose face. It’s better than having us lose species. Why not create an ad hoc mini Manhattan Project? Absolutely! During elections we here politicians about “Americans have a can-do spirit!” but when something like this happens, it’s “Can’t” and “Don’t”. My earlier point was, what if we knew an asteroid would hit the Earth in a year? Would our government just ask Haliburton to figure it out and hope for the best? How did we get “the bomb”? Go to the moon? Commitment and bringing the best minds together under the administration of our government. Imagine if a corporation was put in charge of developing the A-bomb or going to the moon? The A-Bomb would have probably landed on and blown up the moon! If you think this is bad. Just wait till they start offshore drilling in the arctic. Even after this, the oil company lobbyists will be spinning their PR that that offshore drilling in hostile environments is a cake walk. And knowing our government, they won’t do a thing to counter the lobbyists PR. One can only hope that this disaster will make politicians and the public tune out industry assurances for a very long time.